Vernon Darryl Philander was born on 24th June 1985 in Bellville, Western Cape, South Africa. He is an all-rounder (Right-arm fast medium Bowling and Right handed Batting). Vernon comes from a country reputed for producing one of the finest and quickest fast bowlers the cricketing history has ever seen. Though Vernon is not the quickest in his league, he surely has deadly accuracy and can be devastating for the opposition when times are on his side. Not only bowling, Vernon is pretty well equipped with the bat. Coming in the lower batting order, he has played some useful knocks for his side. Philander represented South Africa in 2003 Under-19 World Cup against Bangladesh. Vernon was a talented domestic player. Playing for Cape Cobras in season 2006-07, he had an average of 70 with the bat and 30 with the bowl. It was this amazing display of cricketing skill which established his place in the national squad of South Africa. Philander’s 22nd birthday marked his debut in the ODI match against Ireland in 2007. He picked up four important wickets which was pivotal in South Africa’s win. His debut acted as a catalyst, and Vernon was automatically selected for the World T20 in that very year. On 9th November 2011, Philander made his test debut against Australia, taking five wickets gifting only 15 runs in the second innings and dismissing Australia at 47. He was named the Man of the Series. Vernon’s form was unaltered as he breezed through the series in New Zealand in March 2012. He picked up five wickets in the first test, which ended in a draw. However, Phil finished the second test in Hamilton with the figures of 4/70 and 6/44 in each innings to help the team win. The third test at Wellington was again dominated by him, when he picked up six wickets, showing his consistency in the bowling department. In May 2013, he was rated by ICC as the second best bowler and the third best all-rounder in the world. Philander marked his 100th wicket in December 2013 against India in Johannesburg, and also hit 59 runs from 86 balls. He was ranked as the number one test bowler in 2013. On the 12th of November 2016, Vernon shook Australia in the second test match by taking five wickets. Australia was all out scoring just 85 runs, their lowest total on home ground in 32 years. Philander was the second fastest bowler to claim 50 wickets in test cricket. In 2013, New Zealand toured Africa for their test series. Vernon taking 5 wickets in six overs was one of the South African bowlers who bowled the Kiwis out for 45 runs, the lowest total in a test match of the Millenium. South Africa's redemption Vs India’s tryst with greatness! 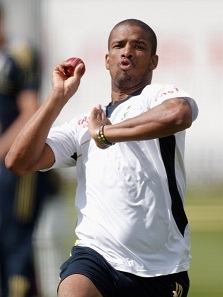 Vernon Philander: South Africa's next big all-rounder?